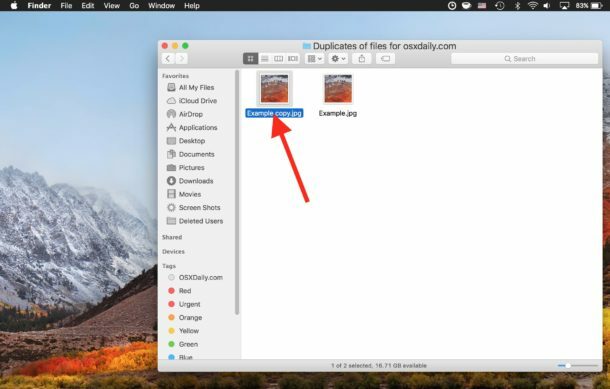 If you ever need to make a copy of a file or folder on the Mac, you’ll be happy to know that there is a super-easy way to accomplish that task thanks to the Duplicate File feature in the Mac Finder. The name is self descriptive, as Duplicate will create an exact copy of any file or folder that is specified, replicating the original item in the same active directory. For example, if you have a file named “Amazing Document” and you make a duplicate of that file, you will then have “Amazing Document” as well as the duplicate file labeled as “Amazing Document copy”. 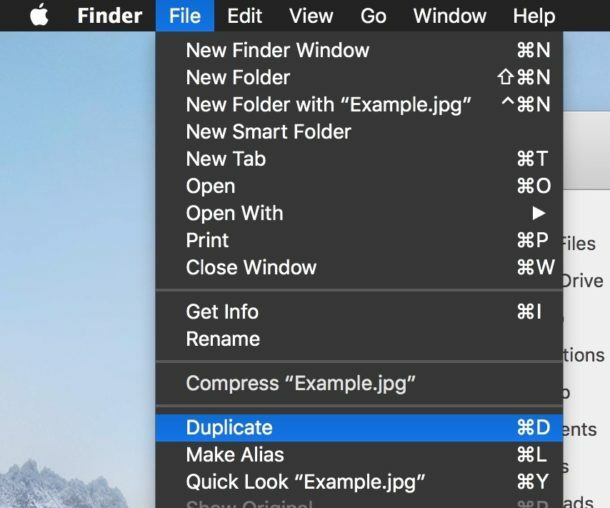 You can duplicate any file or folder this way, and the duplicated version will always have the suffix “copy” at the end of the file name to make the duplicate easy to identify. 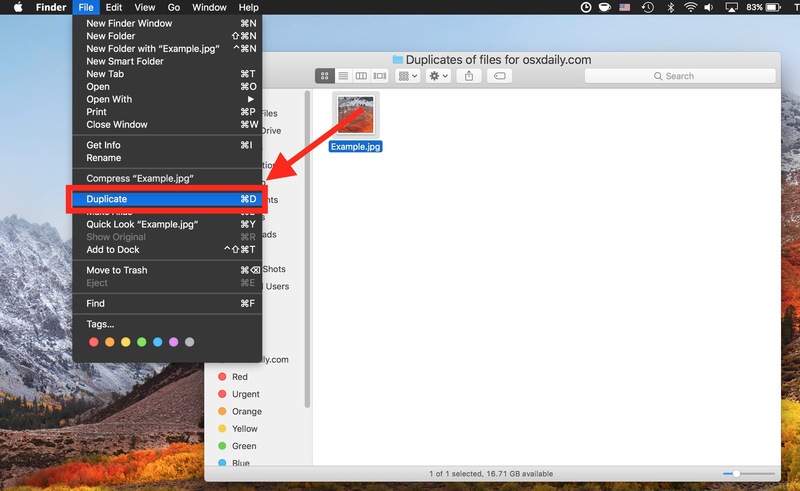 Note that the Duplicate functionality in Mac OS will make a single copy of a file, but if you choose Duplicate on a folder it will recursively make a copy of the folder and all contents contained within. 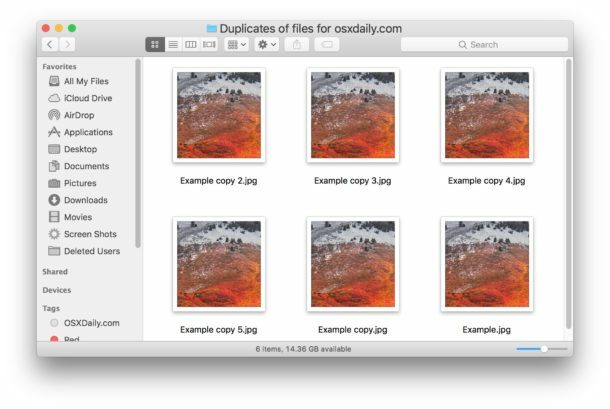 The screen shot examples above show making a copy of an image file named “Example.jpg” and the duplicated version appears in the same directory named “Example copy.jpg” – note the ‘copy’ suffix will always appear in the file name, whether you have file extensions shown in Mac Finder or not. If using the File menu is too slow for you, or if you just prefer keyboard shortcuts, then there’s a handy Duplicate Item keyboard shortcut as well. The keyboard shortcut must be activated from within the Finder with a folder or file selected. For some more advanced Mac users, keyboard shortcuts are faster than menu items. However you approach the duplication process, the result is the same. Just like any other file or folder on the Mac, you can rename the duplicated version or the original if you want to. You can also move the copy or original somewhere else, cut and paste it, upload it to somewhere, delete it, or anything else you would normally do with a file in the file system. Making a copy of a file can be helpful for many obvious reasons, whether you’re going to edit a version of the document, you want a direct backup of a particular file, or maybe you just want to make a copy of something. You can also make multiple copies of the same file, just keep the original item selected and keep duplicating it, each additional copy will include an assigned counting number like “Example copy” “Example copy 2” “Example copy 3” etc. * An additional more advanced trick uses a keyboard modifier Shift+Option to “Duplicate Exactly”, which preserves file ownership and permissions, which can be useful for administrators when they’re copying a system level file, or modifying other users files or folders. There are other methods of replicating files in Mac OS too and the Duplicate functionality is not the only way. Other approaches include using the regular copy and paste commands or menu items on a selected file, holding down the Option key while dragging and dropping files, using the command line cp command, by using the command line ditto command, or dragging and dropping a file or folder to another different volume (either a partition or separate drive). Use whichever method works best for you and your Mac workflow. That’s used when you have an open file within an app. You can enable the “Save As” option menu in macOS again by creating a keyboard shortcut, applies to all versions since they pulled it by default. It was so useful, I do not understand why they removed it. Is “Save As” available in High Sierra by default or still need to enable it? I use Sierra and the keyboard method described here. Since we have moved to High Siera 10.13.3 we can so longer duplicate a file on our server eg a pro forma which we duplicate and then rename before using – we get a warning message “Can’t connect to the server because the name or password is incorrect.” PW is correct or we could not access the server. Duplicate exactly also does not work. – as it make the sound of duplication but nothing happens. Is this an HS glitch? I have heard of many general complaints with High Sierra networking to other Macs and computers. An inability to connect or copy files on a server may be related to APFS file system, or just that High Sierra is notoriously buggy and problematic for apparently random users. But some people find High Sierra works great for them… to each their own. Personally I do not have time to troubleshoot a buggy operating system, I want to be able to copy a file without an error, or connect to networks without error, so I don’t use the High Sierra OS. For me and our work network, we have Macs with Sierra and El Capitan and they work great, no problems for duplicating files, connecting to servers, performing regular tasks, etc. Sigh, another needless feature article about another duplicate feature. Hold the option key and drag any file or folder to a new location, instant EXACT copy. “no way”, not every article is going to be relevant to your skill set, that’s just the nature of covering broad topics like Apple products. Much like going to the grocery store, not every item is relevant to you, but I certainly wouldn’t declare that everything I don’t personally use is ‘needless’. If your skill level exceeds a particular topic like making duplicates of files, that’s fantastic, but keep in mind many other people are still learning topics like making copies of files that are below your particular mastery. Imitation, the biggest form of flattery. Glad I’m not an idiot like yes way or the people who need to learn such simpleton functions from here. Please stay on topic, in this case it’s about duplicating files. The point of the comments section is to add something useful to the discussion and not to troll other commenters or their technical competency. In high Sierra the keyboard shortcut to drag+alt to duplicate a file adding a sequential number is gone. If you had a file named file1.doc, then drag+alt, you used to get a file2.doc. Does anyone knows a work around?